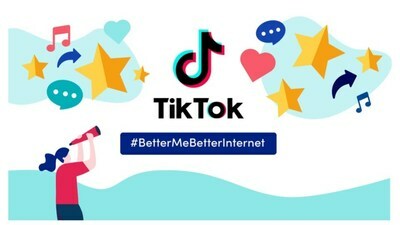 LONDON, Feb. 5, 2019 /PRNewswire/ -- In support of this year's Safer Internet Day, TikTok, the world's leading short video platform, launches #BetterMeBetterInternet, a global challenge to support the annual Safer Internet Day initiative. Starting as an initiative of the EU SafeBorders project in 2004 and taken up by the Insafe network of Safer Internet Centres in Europe as one of its earliest actions in 2005, over the years, SID has become a landmark event in the global online safety calendar, and is now celebrated in approximately 140 countries worldwide. This year's slogan, "Together for a better internet", is a call to action for all stakeholders to join together and play their part in creating a better internet for everyone. As a platform that celebrates trends and embraces diversity, TikTok has become the preferred platform for expression, given its lowered boundaries for sharing, creating, discovering — all made easy on mobile. As it fosters a global community that thrives on creativity and expression, TikTok is committed to helping make its millions of users feel safe and comfortable within the community, which is why it is continuously enhancing and updating its policies, tools and resources to promote a positive and safe app environment. As part of its efforts, TikTok has put in place protective measures by combining content moderation technology with a robust human moderation team. This team, which is based in over 20 countries and regions, now covers 36 languages, an increase of 400% in terms of language support from one year ago. Through its participation in Safer Internet Day, TikTok is playing an important role in raising awareness and addressing the critical and latest challenges in online safety today. "We're delighted to work with a range of stakeholders, including partners and platforms such as TikTok, to raise awareness of a safer and better internet on Safer Internet Day 2019. By working "Together for a better internet" on SID, and indeed all year round, we can empower children and young people to use technology responsibly, respectfully, critically and creatively." Sarah Willoughby, Content and Communications Expert/SID Campaign Coordinator, European Schoolnet. 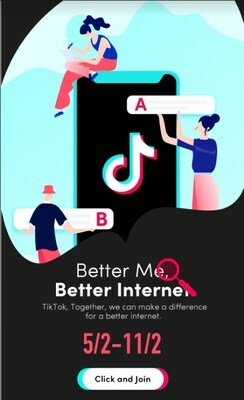 Users can participate in the #BetterMeBetterInternet challenge within the TikTok app by applying customised stickers designed to encourage the adoption of positive online habits. With these stickers, users can embrace positive hashtags such as #Likes, #Respect, #Positivity, #Creativity, #Security, and shove away negative hashtags such as #Cyberbullying, #Negativity, #Trolls, #Anxiety, and #Haters. Many popular creators have joined the challenge to create short videos using these stickers, such as Amber Doig-Thorne (@amberdoigthorne), Connor Darlington (@connor), Steven Mckell (@stevenmckell), Nick Roberston (@imnickrobertson) and Laura Bubble (@laurbubble). TikTok has also launched an in-app quiz to equip users with online safety tips, and users who answer all the questions correctly get to win TikTok merchandise. Promoting a safe and positive app environment is TikTok's top priority, and it has a number of measures in place today to protect against misuse. These include privacy settings, filters, in-app reporting, and moderation. For more information about TikTok's safety efforts, please visit: https://www.TikTok.com/safety/.